ThermaXX Jackets removable insulation covers set the standard for quality. All covers are hand-made in the USA by expert technicians. We guarantee our products with an industry-best 5 year warranty. Our commitment to quality shows through in every step in the process – from needs analysis to quality assurance. Size and Shape – We have standard sizing from 2-inch to 48-inch nominal pipe size, but can create a custom cover for nearly any shape or dimension. Location of jacket – Will the jacket be indoors or outdoors? Is freezing an issue? Temperature of the component being insulated – Does the component need to be kept cold? Or is the component hot? Will the insulation be subject to extreme heat? Ambient room temperature – What is the current room temperature, and what is the desired room temperature? Moisture – Is the area damp or subject to wet conditions? 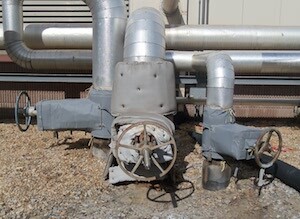 Is the component being insulated at risk for corrosion? Jacket Weight –Is the component being insulated fragile, or is there any other reason a heavier jacket would be undesirable? Should we utilize several smaller jackets? Noise Control – Is reduction of noise a desired outcome? Should we consider acoustic insulation? Data Concerns – Does the client need to report energy savings to government agencies or for internal use? Does the client need a monitoring and alert system? 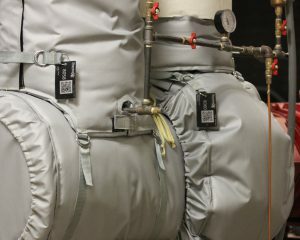 Click through for specifications and more details on our main product groups – hot insulation jackets, cold insulation jackets, anti-freeze jackets, noise insulation jackets, and smart jackets. We often hear complaints that removable insulation jackets do not last outside in the weather. This can be true if the proper care has not been taken when selecting the materials used in its manufacturing. Pictured to the right is a standard insulation jacket, not manufactured by Thermaxx Jackets. It is composed of a silicone cloth for the inner and outer material, fiberglass insulation, insulation pins (to hold the insulation from moving), and lacing anchors and wire to close the parting seams. Notice the loss of luster in the jacket cloth caused by weather in the image above. While silicone is weather resistant, its resistance to solvents, oils, alkalis and acids (acid rain) is poor. The insulation pins and lacing anchors penetrate the outer covering, the insulation, and the inner covering. All of these large penetrations are an entry route for moisture. Fiberglass insulation absorbs water, becoming extremely heavy and the thermal properties are greatly reduced. Now wet, the inside of the jacket causes the areas of cloth around the insulation pins to “rot.” Eventually the fabric pulls away from the pins leaving very large holes, causing the jacket to fall apart. ThermaXX has resolved this problem by constructing our insulation jackets with Teflon/fiberglass cloth for the inner and outer coverings. Teflon has excellent weather resistance properties and is also well known for its resistance to solvents, oils, alkalis, and acids. UV rays have no effect on Teflon and acid rain does not affect the outer cloth in any way. 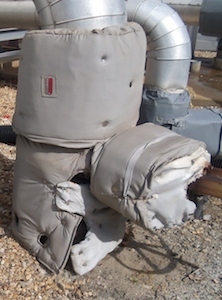 Mold and mildew growth is not supported by the Teflon/fiberglass composite cloth, thus the jacket will not rot and disintegrate as seen the image above. 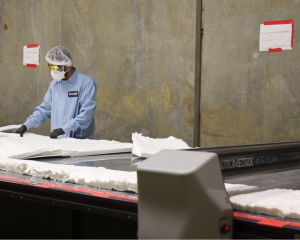 For insulation, ThermaXX Jackets use Pyrogel XT-E, an aerogel insulation that is 3 to 5 times more thermally efficient than fiberglass. More importantly aerogel insulation is hydrophobic, it does not absorb water. 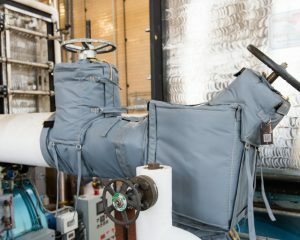 The insulation is sewn as an integral part of the insulation jacket, requiring no insulation pins to hold the insulation in place. Velcro hook and loop is used to close the parting seam and straps with double “D” rings are used to provide extra parting seam securement. At the point of the junction of the insulation jacket and the existing insulation a “sealing flap” is there to help prevent ingress of water. Additionally at the junction of the stem/yoke and the insulation jacket there is a sealing flap to ward off potential rain entry. Learn more about our materials using the links below. After the right materials are chosen for the job, patterns are made by our experienced Computer Aided Drafting and Design department and released to production. Our production manager then hand selects the materials for manufacturing to match the design criteria. Jackets are manufactured to precise specifications, then inspected by the Quality Assurance Department for construction accuracy and shipped. Thermaxx is committed to quality. To prove we mean what we say, we guarantee our insulation covers with a 5 year warranty. Try them for free today! 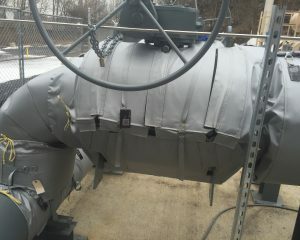 Thermaxx LLC, specializes in designing and manufacturing removable insulation covers to meet our clients’ diverse needs.